For boys who are in second grade and/or are 8 years old. 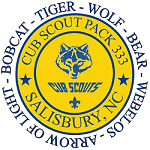 Scout camping, you may substitute a family campout or a daylong outdoor activity with your den or pack. according to the time of year you are camping. Tell how you will be prepared for each one. 1. Participate in a flag ceremony, and learn how to properly care for and fold the flag. reverent or helped you better understand your duty to God. reminds you of how to show reverence, or demonstrates your duty to God. families at a den meeting. discuss how you showed respect for wildlife. 6. Demonstrate what it means to eat a balanced diet by helping to plan a healthy menu for a meal for your family. Make a shopping list of the food used to prepare the meal.